← Hope For Sale, Get Your Hope!! 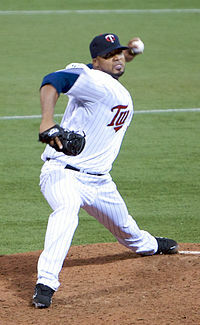 In May of 2006, the Minnesota Twins decided to bring young phenom, Francisco Liriano, out of the bullpen to relieve the struggling Carlos Silva on a permanent basis. For those reminiscing of the days when the Twins actually made trades, Liriano was a part of the impressive bounty that the Twins received in the trade of A.J. Pierzynski to the San Francisco Giants. Quick aside, it makes no sense that Twins fans boo Pierzynski when he comes to town. Prickly personality aside, him being traded landed the Twins Joe Nathan, Liriano, and Boof Bonser. Considering Pierzynski was little more than a rental for the Giants, that is an incredible haul. Alright, back to the phenom. Liriano burst onto the scene just Nuke, repping a left arm that had been touched by the Gods. Liriano did not just “enter the starting rotation,” he kicked the door down and, to borrow a phrase from Calvin “Nuke” Laloosh, “announced his presence with authority.” Liriano absolutely dominated his way through the 2006 season to the tune of a 12 -3 mark that included multiple rookie of the month awards and a microscopic 2.19 ERA. During this period of dominance, it was not uncommon for him to out-duel his fellow pitching savant, Johan Santana. He even earned himself a nickname, Frankie K. He did not just strike people out, he made people look foolish. All Star caliber players would walk away shaking their head after chasing Frankie’s slider, a pitch that, not only broke late, but literally snapped off like it had fallen off a cliff. By the All-Star break, Frankie had officially arrived. And, even though Santana’s future with the team was uncertain, Twins fans talked themselves into believing that there was a chance that they could lock down two of the best young arms in the league. There was no ceiling to how strong their staff could be with Johan and Liriano leading the way. Then in the fall of 2006 Liriano experienced stiffness in his throwing elbow. After a stint on the DL and multiple failed attempts to rehab the elbow, Liriano decided he needed to undergo the infamous Tommy John surgery to repair the tendons in his elbow. The phenom missed all of the 2007 MLB season. Frankie's slider made certifiable All-Stars look like junior varsity hacks. When Frankie K returned in April of 2008, he did not look the same. His slider did not have that same sharpness it had before. Instead of swinging over the top, players could foul off the slider and sit on a fastball. Frankie started the season 0-3 with an ERA over 11.00 and he was promptly sent to the minors. We did not know it then, but, this may have been the beginning of the end for Frankie K.
In fact, Liriano’s situation might best compared to that climatic, emergency room scene that appears at least once a week in every medical drama on TV, think House or ER. You know the scene, Dreamboat Dr. Y valiantly attempts to save Patient X. Maybe the Patient flatlines once or twice, has to be resuscitated using compressions or a defibrillator, but, Dreamboat brings the patient back from the brink. The outlook appears good and then, without notice, tragedy befalls Patient X again. And round and round it goes, until, ultimately, Patient X finds love and is cured or tragically passes in the arms of their significant other. If the beginning of 2008 was our first sign of trouble, Liriano got compressions when he went to the minors. He went 10-0 with a 2.67 ERA. The outlook appeared good. He received an August call-up and promptly went 3-0 with a 1.45 ERA. His pitches still did not appear to have their pre-Tommy John sharpness, but, the results were there. 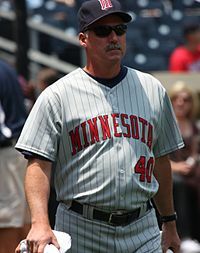 Not even Rick Anderson and his glorious soup strainer could bring Frankie's back from the brink. Then, 2009 happened. An entire season spent on the brink. 5-13 with an ERA of nearly 6.00. This crash appeared to be it. Liriano was done. 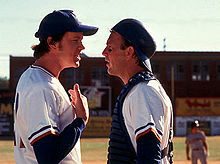 Not even Dr. Dreamboat (Pitching Coach Rick Anderson) and his bag of tricks could save Frankie K. But, like any good medical drama, it was not over just yet. 2010 was a bit of a renaissance year for Frankie K. He did not return to his 2006 form, but, he looked stronger. His pitches, while not quite as nasty, were still very effective. In our medical drama analogy, Frankie K had beaten the flatline yet again. It took a defibrillator (think all of 2009), but, he made it. Twins fans started thinking, like any person rooting for the protagonist, this just might actually work out. Alas, 2011 was a return to the 2009 form. That blasted flatline. Frankie “Not So Much” K gave up 24 runs in his first 23 innings. Even in his best single game performance, a no-hitter in May, Frankie gave up 6 walks. He would finish the year with a 9-10 record and ERA just north of 5.00. 2012 was going to be Frankie’s last chance. Either he would bounce back with a vengeance, returning to his 2010 form, and become the effective pitcher everyone knows he can be, or, he would continue his fall, leaving only a shadow his former self. Through 3 games, Frankie is 0-2 and has an ERA that is just south of infinity. In his most recent tilt with the New York Yankees, you could tell many of the Yankee hitters were having a hard time distinguishing whether or not the game had started or if they were just taking extended BP. While the time of death has not yet been declared, the plot seems to be trending towards this being an unhappy ending. Here’s hoping Frankie beats the odds, finds true love, and wins the Cy. This entry was posted in Home, Twins v. Brewers and tagged A.J. Pierzynski, Boof Bonser, Carlos Silva, Cy Young, ER, Francisco Liriano, Frankie K, Grey's Anatomy, House, Joe Nathan, Johan Santana, Minnesota Twins, Nuke Laloosh, Rick Anderson, Twinks. Bookmark the permalink.